Now that the U.S. Federal Reserve is raising interest rates, it won't be so easy to hide the dire consequences of years of loose money policies – especially all the quantitative easing (QE). "They've boxed themselves in and taken America on a white knuckle ride they didn't sign up for," said Money Morning Chief Investment Strategist Keith Fitz-Gerald. You see, when the financial crisis of 2008 struck, the Fed first lowered interest rates until it got to zero, where they remained until today. But because the U.S. economy was still sputtering despite zero interest rates, the Fed then launched QE – the mass purchasing of U.S. Treasury bonds (essentially U.S. government debt) and the toxic mortgage-backed securities that helped trigger the 2008 crisis. 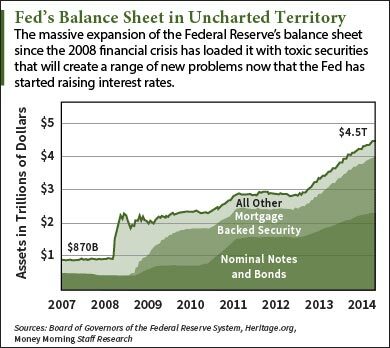 The purchases added $4.5 trillion to the Fed's balance sheet, including $1.7 trillion of mortgage-backed securities. While these assets helped the Fed keep rates low, in an era of Fed interest rate hikes, the bloated balance creates issues the agency has never before faced. For one thing, it won't be easy to "normalize" the balance sheet back to below $1 trillion (about where it was before the 2008 crisis). To sell those assets, the Fed will need buyers. "There's a reason the Fed is the buyer of last resort. Nobody wants this stuff," said Fitz-Gerald. He noted that the American taxpayer ultimately funded the QE purchases and will suffer the most when the Fed encounters problems unwinding those assets. Fitz-Gerald said the big banks used the Fed and its QE program to socialize the risks they took in creating the 2008 crisis. "They gain, but the public pays," Fitz-Gerald said. "And now the American people own a $4 trillion toxic balance sheet." Another big problem with a Fed rate hike now is basic to bond investing: Bond prices fall when interest rates rise.